The Memorial Candle Program has been designed to help offset the costs associated with the hosting this Tribute Website in perpetuity. Through the lighting of a memorial candle, your thoughtful gesture will be recorded in the Book of Memories and the proceeds will go directly towards helping ensure that the family and friends of Lola Burnworth can continue to memorialize, re-visit, interact with each other and enhance this tribute for future generations. Lola Vaughn (House) Burnworth passed away on August 3, 2018 in Las Cruces, surrounded by her loving family. She was born September 24, 1931 in Salado, Texas to Carmen and Edith House. 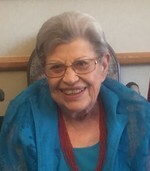 Lola attended school in Hatch and Roswell, and graduated from Draughon’s Business College in Lubbock, Texas and College of the Sequoias in Visalia, California. She was a published author and a member of the Society of Southwestern Authors in Tucson, as well as a 60 year member of Beta Sigma Phi Sorority. Lola married Dale Burnworth in Roswell on July 29, 1950. She supported the family while Dale earned a Bachelor of Science degree in mechanical engineering from UNM. They owned and operated a successful HVAC company in Visalia, California, designed and fabricated steel components for prisons and jails, and designed and built a number of unique homes, including an underground house in Las Cruces. In their later years they traveled in their RV and were able to see nearly all of the United States. They returned to Las Cruces and built their final home together in 2005. Since Dale’s death, Lola resided at The Village at Northrise. Lola was a classy lady from the start, and even in her elder years she never left her apartment without being properly dressed, hair styled, matching jewelry and of course, lipstick. She was a true artist with fabrics, quilting, needle point, crochet, and even upholstered her own furniture once. She was a voracious reader, loved to do crossword puzzles, and kept abreast of politics and current events, as well as being a big fan of NFL football. She is survived by daughters Laine Burnworth of Las Cruces, and Traci Scott (Chris) of Cloudcroft; grandsons Brook Weigant, Ryan Scott (Lori) and Clay Scott (Skyla); and three great grandchildren, Chelsea Weigant, Wyatt Scott and Henley Scott. She was preceded in death by her parents, her sister Peggy Boyer, and her husband of 63 years, Dale Burnworth in 2013. The family would like to extend our sincere and heartfelt thanks to Dr. William Baker and Susan, and to all the staff at The Village at Northrise. Lola became good friends with the nursing staff, the caregivers, the dining room staff and even the van drivers. Many of these friends were like extended family to her. A special thanks also goes to Mesilla Valley Hospice and her loving long-time nurse, Lennie Brown. At her request, cremation has taken place and no services are planned. In lieu of flowers, donations may be made to Mesilla Valley Hospice, 299 E. Montana, Las Cruces, NM, 88005. Her life was a blessing, her memory a treasure. She is loved beyond words, and missed beyond measure. To send flowers to the family of Lola V Burnworth, please visit our Heartfelt Sympathies Store.